St Andrews Country Club is located in upscale Boca Raton and is repeatedly praised as one of the best country clubs around. In fact, it actually was proclaimed the 15th Best Club in the Nation by "Platinum Clubs of America". Accordingly, it offers impeccable views of 720 acres of tropical foliage and rolling fairways, as well as 70 acres of shimmering lakes, undoubtedly making this incredible neighborhood one of the most luxurious premier golf and country club communities in all of South Florida. St Andrews Country Club contains 740 custom built estate homes, each finished with overlooking views of the pristine lakes or golf courses. A truly unique neighborhood, residents have amazing options ranging from ranch style homes, Mediterranean style palazzos, or Tudor designs to choose from, with no two homes alike. 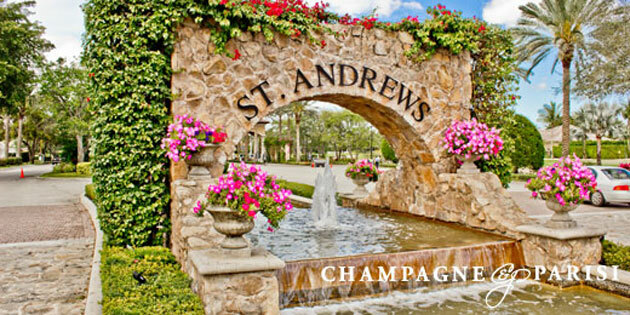 All of these homes are vast and expansive, and being a homeowner here allows you to partake in the countless, world-class amenities that St Andrews Country Club offers. The clubhouse at St Andrews Country Club spans 125,000 square feet and truly exemplifies elegance and radiance. It offers casual as well as formal dining venues, from gourmet buffets to ala carte menus, with all of the menu items carefully prepared and seasoned from the on-site herb garden. For residents who enjoy staying outdoors, dining service is offered by the resort style pool. Additionally, there is a private child's pool and an amazing play area. Members also frequent the beautiful fitness center, which features yoga, pilates, and Zumba, as well as a full service luxurious spa. For golf enthusiasts, the 18-hole championship golf courses are designed by no other than Arnold Palmer and Gene Bates. Each course is uniquely challenging, and there are essentially no tee times. Of course, the beautiful waterways and rolling greens make for a surreal atmosphere while you enjoy your golf game. As for tennis, St. Andrews features 15 Har-Tru clay courts, five of which are lighted, a red clay court, and a center court with grandstand seating. Living at St Andrews Country Club is so full of comforts, activities, and beauty; it's no wonder why so many people desire to call this exclusive neighborhood home. Click to view all homes for sale in Boca Raton, FL.